Those who were around Raleigh, N.C., in the 1970s and early 80s may remember the popular Village Subway: underground shops, restaurants and night clubs that contributed to a lively music and entertainment scene in the Cameron Village shopping center. Positioned between Washington, D.C., and Atlanta, Ga., Raleigh was a popular stop for touring musicians and still is today! Modeled after Underground Atlanta, the name Village Subway came from its New York City-like subway entrance with a long stairwell that led to paintings of trains. 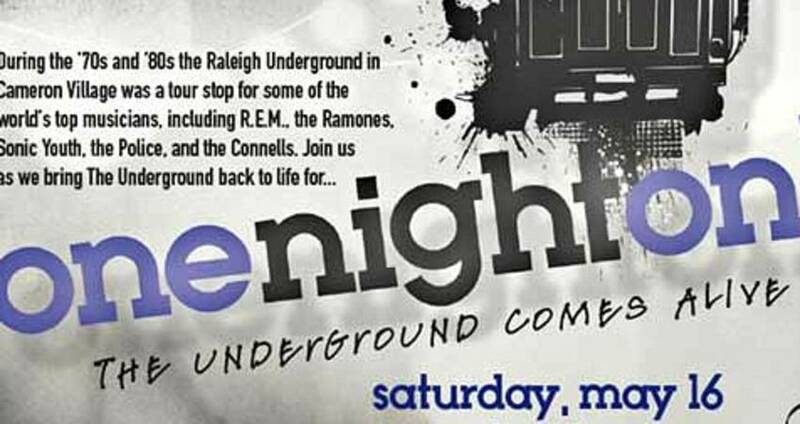 As home to venues The Frog and Nightgown, the Bear&apos;s Den, Elliot&apos;s Nest, Cafe Déjà Vu and The Pier, the Raleigh Underground attracted some of music&apos;s best up-and-coming talent; famous for hosting the likes of Bette Midler, R.E.M., The Police, The Ramones, Pat Benatar, Joan Jett, Sonic Youth and The Connells. Sadly, the Underground was shut down in 1984 and its main entrance was paved over. Its legacy lives on, however, and newer visitors have discovered the history of this subterranean landmark thanks to local blogs Goodnight Raleigh and Candid Slice. Tomorrow, for one night only—Sat., May 16—the Underground will re-open for a sold out party benefiting the Interfaith Food Shuttle&apos;s BackPack Buddies. "Whether you&apos;ve heard the stories, frequented the Underground or tried to sneak in on occasion, THIS is your last chance to get in the door," hypes the Cameron Village website. A fashion runway show, live music, arcade games and historic photos will highlight the event. But for many, the main attraction just might be the chance to see the iconic space that was once home to a piece of music history. The now open area, relegated to storage, sits beneath what&apos;s become the Fresh Market and the Cameron Village Regional Library. It&apos;s scheduled for refurbishment later this year, but will not be open to the public upon completion. There&apos;s some good news for those still missing the Village Subway, however. Triangle Business Journal says that the folks at Candid Slice are teaming up with the City of Raleigh Museum (COR Museum) on an exhibit about the historic site.